TRY to tell kids to SMASH the Eggs on Backs - Not Heads. *See instructions below to make your own - biodegradable materials required. 2. 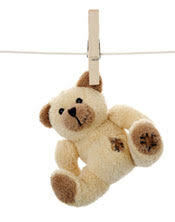 Empty out the contents and gently rinse each egg in warm, soapy water with a small amount of bleach. 3. Leave the shell out to dry overnight. (Note: save the egg cartons for storage and for selling to the kids) Also, wash sink and area carefully after handling raw egg materials. 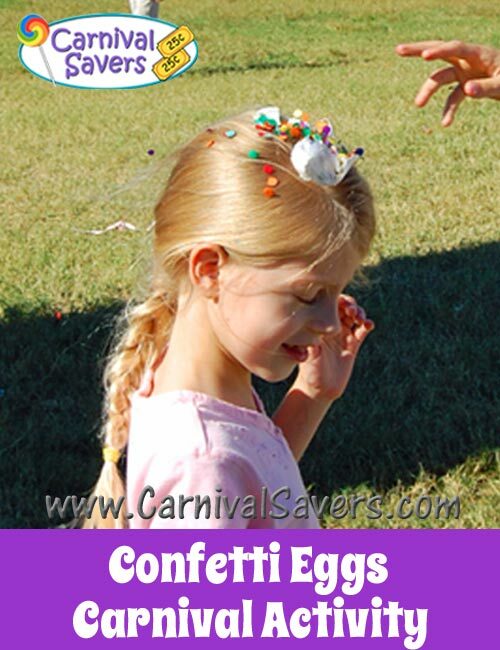 After completely dry, fill eggs 1/3 to ½ full with confetti. Carefully, put dots of glue on the outside top of the shell and place a tissue on top to keep confetti inside egg until used. See photo above of finished eggs ready for kids! Starting months before the carnival, one school asks local grocery stores if they will save cartons of eggs that are past their sell by date. Volunteers pick up the eggs and distribute to others who help with this fundraising project. Just like most carnival booths, you will want tables for the cartons of confetti eggs, a covering and chairs for your volunteers is most welcomed and of course a ticket box. 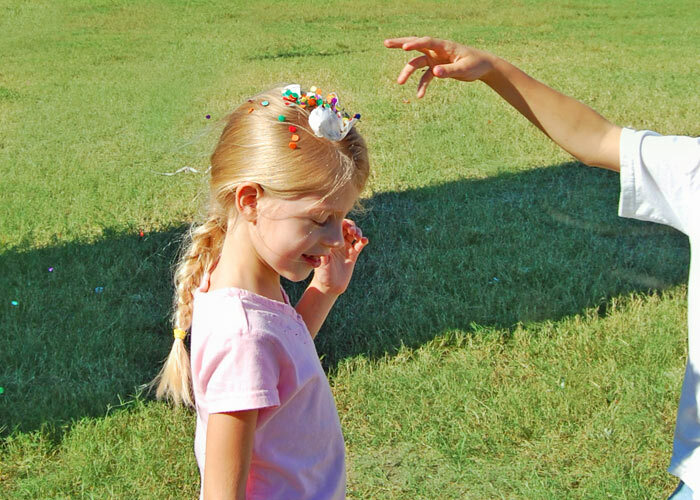 Kids pay tickets to purchase confetti eggs to crack on their friends. Remember, an outdoor carnival is a must for this booth! 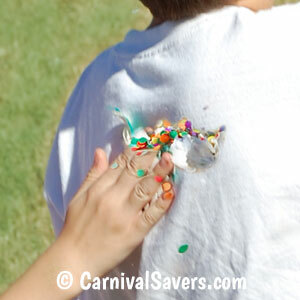 Kids love to smash these eggs on their friends during the carnival! This carnival booth fundraiser is fantastic for schools that have an abundance of volunteers or at least very good parental school involvement. 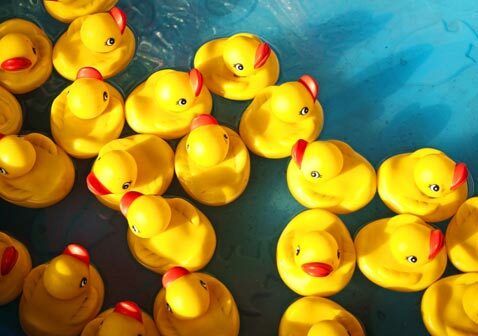 Note: This carnival booth is virtually free, which means it is a fantastic fundraiser – but, it takes time and a large team of volunteers for it to come together. Do not think that 3 hard working volunteers can do this by themselves – they will be burned out and it will be your first and last year for your Confetti Egg Booth! Unless you can purchase the eggs after a holiday on clearance, or you have at least 6 weeks and a team of volunteers, just keep this booth in mind for next year’s carnival! Some schools sell as many as 500 cartons of eggs!! Of course, you can start small in the beginning. Be sure to charge at least 50 cents for each confetti egg or $5 for a dozen. 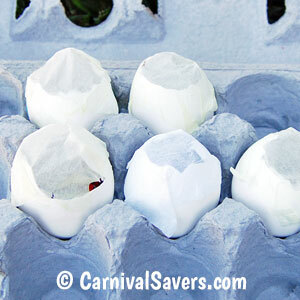 Earth Friendly Thought - Gardeners say that eggshells are a fantastic way to add nutrients to a garden or lawn. So, having the Confetti Egg Booth (with only paper confetti) on school grounds may even help the environment just a hint! CARNIVAL SUPPLIES For The CONFETTI EGGS BOOTH!